Virtual Reality has the potential to fully transform viewers’ experience but real mass adoption is subject to providing life-like quality content which poses many infrastructure challenges. The Cisco Visual Networking Index for Mobile predicts that Virtual Reality traffic will increase at a 60% compound annual growth rate thru to 2021. The number of VR headsets is expected to grow at the same rate to nearly 100 million by 2021 and more than half of these will be connected to smartphones. From broadcasting and social media to enterprise and online gaming, many industries can benefit from immersive Virtual Reality experiences. Virtual tickets are new revenue generators that can become an important part of live events such as sports, concerts or trade shows. While media companies don't want to miss opportunities on what might be the next big thing, they are cautious as they are still on the learning curve of how to create and deliver content in a whole new way. To achieve a fairly immersive experience, 360 degree video resolution needs to be at least 8K. Handling such high resolution has a significant impact on both bandwidth and compute across the entire workflow. On one hand, bandwidth needs to be optimized in order to carry 8K VR video to the central processing elements over existing networks. With a 50% bitrate improvement over AVC, HEVC plays a key role on VR live streaming enablement. On the other hand, HEVC adds to the VR computational complexity with the computational cost of real-time 8K HEVC encoding being 40X that of Full HD AVC. 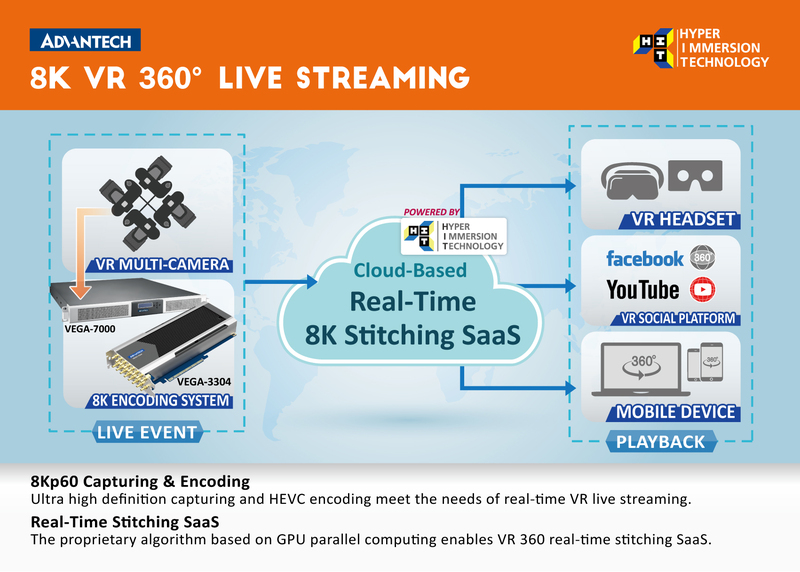 In addition to real-time encoding, VR live streaming also relies on real-time stitching of several video sources from different cameras to generate the 360 degree view. This new stage also consumes high computational resources and is critical to the final VR quality. To produce live 8K VR content, HEVC encoding of several ultra-high definition streams will be required in order to keep bandwidth under control while providing a good quality visual experience. However, live event production has a series of constraints in terms of space, weight and power. To tackle this, hardware acceleration can be leveraged in order to build compact live 8K VR encoders that streamlines VR content production and can be hidden from the 360 degree view. The VEGA-3304 is a PCI Express accelerator that supports 8K acquisition, real-time HEVC encoding and can be plugged into standard server GPU slots to create powerful and efficient live VR encoders. Enjoying a reduced bandwidth, the encoded streams can be sent to the cloud to be stitched and delivered. The proposed cloud architecture is shown in the image below and greatly simplifies 8K VR live streaming workflows enabling hyper immersive solutions without jeopardizing quality. Content producers just need to setup the camera and compact live encoding systems onsite. Live feed from the 4K cameras mounted on a 360 degree rig are acquired and encoded by the VEGA-3304 to be streamed to the cloud. 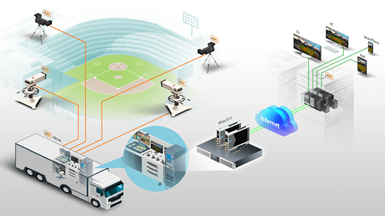 Storage and real-time stitching are handled on the cloud and provided as a service which minimizes onsite deployment complexity and optimizes operations when producing immersive VR live events such as sports and concerts. Hyper immersive and smoother user experience: the VEGA-3304 is the first commercial-off-the-shelf accelerator to support 1-channel 8Kp60 or 4-channel 4Kp60 real-time HEVC Main 10 encoding, enabling high quality VR live streaming and low-latency user interaction. Acquisition support: raw video from VR cameras can be directly acquired by the VEGA-3304 via built-in 16-ch 3G-SDI inputs that maximizes PCI Express slot usage. Low power and compact: the VEGA-3304 is the first of its class to deliver high-quality 8K HEVC encoding in a compact PCI Express accelerator with less than 70W power consumption allowing for reduced size onsite solutions when producing live VR content. Cost efficient and flexible: driven by the convergence of IT and broadcast technologies, the VEGA-3304 can be integrated into server based applications leveraging economies of scale of COTS hardware. Developers can easily offload heavy lifting video processing tasks to the VEGA-3304 via Advantech’s Linux and Windows SDK which provides enhanced features including an FFmpeg plugin and virtualization support. This reduces VR live streaming solutions time to market and in-house development efforts avoiding the costs of integrating and developing customized solutions. On the way to deliver truly immersive VR live streaming experiences that unleash the WOW factor and engage with the broader audience, media companies will need to address many infrastructure challenges. Video solutions developers can now leverage the processing power of the VEGA-3304 to upgrade the computational capacity of video equipment and also build new cloud architectures that streamline high-quality live VR workflows. The VEGA-3304’s impressive encoding quality and unrivaled performance can be integrated as part of software-based, virtualized 8K VR deployments enabling the next wave of innovation in the media industry. The DSP-8681 integrates four Texas Instruments TMS320C6678 multi-core digital signal processors (DSPs), the PLX® ExpressLane™ PEX8624 PCIe switch, and the Xilinx XC3S200AN Spartan-3 FPGA to achieve the highest possible performance levels in a half-length PCIe form factor. The DSPs provide fixed- and floating-point capabilities and include packet accelerator support for various transport plane protocols and a security accelerator engine which supports a wide range of security and encryption standards including DES. The DSP-8681 includes Serial RapidIO and SGMII daisy-chains for connecting all DSP devices. Each DSP device is also connected by two separate PCI Express lanes (PCIe x2) via the PEX8624 enabling up to 10Gbps non-blocking throughput. The card can support 120 channels in an H.264 mobile video application (CIF, 30fps) and 60 channels in a content delivery network using H.264 (SD, 30fps). For HD Broadcast applications, the DSP-8681 is capable of supporting 4 channels of AVCIntra-50, 10-bit, 4:2.0 at 60fps. The 32 DSP cores on the DSP-8681 make it ideal for power efficient solutions based on commercial and industrial servers needing the highest performing video processing technology on fast-to-deploy PCIe add-in cards. It is a perfect fit for applications in many industries such as digital media, communications, video-surveillance, medical imaging, bioinformatics, radar, sonar and instrumentation, high performance computing as well as test and measurement.